The Llano area has been blessed with many fiddlers who have kept the tradition of grass roots Texas music alive. Many communities in Texas share a similar story of local fiddlers and musicians playing, teaching and inspiring the next generation of passionate torch bearers for Texas music. Some of Llano’s rich fiddling history includes fiddlers Otis Light, Tilmon Harlow, Eddie McDonald, Herbert Goff, Jack Goff, Wendy Goff, Woodrow Thomas, Bud Otto, Wilford Tumlinson, Harmon Ellis and Arthur Lee Simpson. Arthur Lee Simpson played fiddle with the Ramblin’ Rose Band and backed up Ernest Tubb, Charlie Pride, Loretta Lynn, Hank Thompson and George Jones when they came to Llano’s Ramblin’ Rose dance hall to perform. People actually danced at these performances--imagine dancing to George Jones. The first Llano fiddle contest was held in April 1976, on the banks of the Llano River in Robinson Park. Some great fiddlers and musicians participated in the Llano Fiddle Contest throughout the years, including Terry and Dale Morris, Wes Westmoreland, Weldon and Ricky Turpin, Roy Thackerson (the fingerless fiddler), Randy Elmore, and Royce and Ray Franklin. When the weather cooperated there wasn’t a more charming atmosphere and environment to experience a little bit of Texas. Unfortunately, the weather did not always cooperate. One year, under a large Oak tree as listeners peacefully sat in lawn chairs or on blankets, blissfully watching and enjoying the music. Then a water line busted. A good soaking was had by all. The next year a hail storm drove the competition into the nearby community center. The noise of the hail pelting the metal roof of the community center made it almost impossible to hear the fiddlers’ music. Organizers decided to move the competition indoors to the American Legion Hall, which hosted the completion for many years. After the contest, many fiddlers would gather at the home of Hazel Overstreet and continue playing into the early morning hours. Armand Taylor organized the first contest with the Texas Old Time Fiddlers Association. Boots Simpson, Ken Hazelett, and Bud Otto would follow as contest organizers. 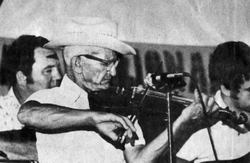 Bud Otto organized the Llano Fiddle Contest until 1991. There were no contests from 1992 through 1996. In 1997 Floyd Ratliff picked up the torch and revived the Llano Open Fiddle Contest. The contest continued under Floyd Ratliff’s direction until his passing in 2007. The contests in 2008 and 2009 were headed up by Bill Tuckness. There was no contest in 2010. That year, the Llano Music Group decided to bring back the Llano Open Fiddle Contest in 2011 and expand the event to a three day fiddle extravaganza. The tradition of Llano’s fiddle contest continues, welcoming fiddlers and musicians who want to compete and share a common passion with peers and fans alike. Hopefully their passion will transfer to a young girl or boy, awestruck by the sweet melodic sound of Texas fiddle music. Otis (Ode) Light, born January 1892, is one of Llano’s historical treasures. Ode was a champion fiddle player and played an original Italian Glovan Paolo Maggini fiddle (excuse me, violin), dated 1622. He lived in the Six Mile community just west of Llano. The Otis Light Dance Band played in Llano and surrounding communities for many years. The band members were Otis Light on fiddle, James Light on banjo, Ben and Carl Light on guitar and Willis Ratliff on bass. Some of Otis Light’s fiddle recordings in 1937 are stored in the The American Folklife Center of the Library of Congress. During World War I, Otis was wounded in the leg and traveled home on a hospital ship. He befriended a German man who gave him a Stradivarius violin, which was in pieces. The story goes that he wrote the classic fiddle waltz “Over the Waves”. Of course, "Sobre las Olas" (or “Over the Waves") is the best known work of Mexican composer Juventino Rosas (1868–1894). There is some discussion that Austrian Johann Strauss wrote the “Over the Waves” melody. Maybe Otis’ German friend taught him the tune on that hospital ship. Regardless, Otis was playing “Over the Waves” in Texas as early as 1917. The Stradivarius, dated 1717, that Otis obtained in pieces was carried around in a flour sack. Ode and Floyd Ratliff of Llano spent many hours putting it back together. It is believed that the fiddle is still somewhere in Llano, safely stored. Otis Light had a very colorful vocabulary. His grandnephew, Willard Campbell, remembers getting a whippin’ for repeating some of Otis’ bad language. On a national radio show, Otis was being interviewed and colorful language slipped in every so often. Otis’ wife, Bena Light, was dismayed and she called him over. Away from the microphone, you could hear her tell Otis that he was on national radio and to stop cussing. Otis replied with choice words “oh the hell you say” and walked back to the microphone and continued his interview. There are Otis Lights in every small community of Texas, playing and passing on stories of the fiddle and fiddle music, because the fiddle IS Texas. We pay tribute to those who carry on the tradition, for they are our roots. They play because they love to play and their spirit enriches our souls with the sweet melodies of a time slowly fading away.